If your concrete canoe competition is not being covered... please let us know and we'll do it. Ecole de Technologie Superieure (ETS) won the U.S. National Concrete Canoe Competition ((NCCC). The University of Nevada, Reno finished second followed by the University of Florida in third. The defending champion, Cal Poly - SLO finished fourth with Utah State University in fifth (spreadsheet). ETS claimed victory (above - photo courtesy of ACI) with "Savannah" (below). Going into Urbana, ETS had an impressive average placement record of 7.43 and had finished top three in three of their last five U.S. appearances. This year's appearance in Urbana marked ETS's eighth U.S. national appearance. They are the tenth school to win the U.S. title (details here) and their win raises the team's average placement record to 6.63. The University of Pittsburgh at Johnstown will host the competition in 2014. Première place - La Compétition Nationale Canadienne de Canoë de Béton: Universite de Sherbrooke. La Compétition Nationale Canadienne de Canoë de Béton 2013 (CNCCB 2013) - The 2013 Canadian National Concrete Canoe Competition (2013 CNCCC)] - was hosted by the Canadian Society for Civil Engineering (CSCE) and the organizing committee of Ecole de Technologie Superieure (ETS). The Universite de Sherbrooke won the competition. École de Technologie Supérieure finished second followed by the University of Toronto in third. According to Wikipedia, Sherbrooke previously won the competition in 2006 and 2007. They placed second four times and third once. The 2013 BetonKanoeRace (concrete canoe race) will be held in Utrecht, the smallest Providence of the Netherlands, located in the center of the country. The Utrecht Technical Association (UTV) will host the event. The University of Twente is the defending champion. Competitions such as this date back to the early '70s and this is the Netherlands' 36th competition. Every few years, the Federal Association of the German Cement industry (BDZ) in Düsseldorf organizes a special type of spectacular... a concrete canoe regatta. This year, the competition will be held on Dozen large pond located in Southeast Nuremberg. In 2011, over 90 teams registered... with participants coming from a number of other countries including Switzerland and the Netherlands. The University of Twente (Enschede, Netherlands) is the defending champion. In 2011, the design competition was won by the Georg-Simon-Ohm University Nuremberg while the University Lusatian defended their title in the Open Class. Olympian Ryan Lochte poses with "Carter" and "Repligator" at Lake Wauberg, Micanopy, Florida. Photo from People Magazine; Robert Erdmann. Eleven-time Olympic medallist, Ryan Lochte, recently posed in a shoot for the "2012 Sexiest Man Alive"... with Carter, his 5-year-old Doberman pinscher, and the University of Florida's 2009 concrete canoe, "Repligator." Ryan is a UF alumni who majored in sports management. The Gators will defend their Southeast Conference concrete canoe title at Miami in March. "On the 40th anniversary of concrete canoeing, it just seems right that the frenzy returns to the Midwest where it all began." Team UAH float tests "APOLLO" before packing the canoe up for competition in the Southeast. Team UAH has constructed a launch vehicle that they hope will take them to the winner's circle for the sixth time at the national level. and the rest of the Southeast contingent at Miami on March 14-16, 2013. Have you capitalized on our Message Board run by co-host University of Nevada Reno? Have you read the latest issue of co-host Laval's Concrete Canoe Magazine? The University of Illinois at Urbana-Champaign is our newest co-host and will join forces with Universite Laval to showcase Photos/Videos related to concrete canoeing. The UIUC site was launched by Armen N. Amirkhanian, a past co-captain of 3CT (Clemson). Some of you may recognize his last name because Serji, his Dad, served as 3CT's faculty advisor for many years. All of our co-hosts are most willing to showcase your efforts, so please feel free to contact them. Better yet... Why not volunteer to become a co-host too? The Inland Branch held their 23rd Annual Concrete Boat Race Day at the Victoria Lake Club in Germiston, near Johannesburg on September 29th. The event has been held every year since 1990. This year there were more than 70 entries. Students were required to design and construct cement-based boats of the ‘paddle-ski’ kind. This was a departure from the traditional ‘canoe-like’ craft that had been specified in the past, in order to test the students’ application of concrete technology and project management. while the University of Pretoria won the student race (right). Here are the final results from 2012. The 2013 Boat Race takes place on September 28, 2013. The 18th Annual All Japan Challenge took place on August 25th. The event was sponsored by the Japanese Society of Civil Engineers and included 37 College and University teams from across the country. Utsunomiya University (above) defended their national title. Did you know that the first concrete canoe race in Japan took place in Saiko in 1995 (history) and events now take place throughout the country (Japanese venues)? (If you can't read Japanese... copy site into Google and press translate... jag). Teams in the U.S. are scored in four categories at the national level: Design Paper, Final Product, Oral Presentation, and Races. How many total points are distributed during the competition? What is the maximum number of points that any one school can earn? A win by their women's endurance team (above) helped Cal Poly - SLO win their third consecutive national title. The University of Twente successfully defended their title. The 2012 BetonKanoeRace (concrete canoe race) was held in Zwolle, the capital city of the province of Overijssel, Netherlands. The University of Twente won the competition; results can be seen below. Competitions such as this date back to the early '70s and this was the Netherlands' 35th competition. Université Laval defends their Canadian National title. The Canadian Nationals (CNCCC) was hosted by the Canadian Society for Civil Engineering (CSCE) and the organizing committee of the Université de Moncton. The field included École de Technologie Supérieure, Université Laval, Université de Moncton, University of Ottawa, École Polytechnique, Queen's University, Université de Sherbrooke, University of Toronto, and University of Western Ontario. Laval was the defending champion. This year, Laval won all of the races and placed first in the design paper and the oral presentation. ETS finished a close second... 6.3 points (out of a possible 100 points) behind Laval. Sherbrooke was third. Laval and ETS both qualified for the US Nationals and will face off with 20 other competitors on June 14th-16th in Reno, Nevada (see below). The University of Twente (Enschede, Netherlands) won the competition. The French Nationals were held in Saint-Laurent-Blangy, a light industrial suburb and river port on the northeast side of Arras. The competition was won by the University of Twente who has become the dominant player in Europe. This was the first time that the team competed in France. The first Concrete Canoe Challenge took place at IUT Grenoble in 2001. The French Nationals are typically held once every two years. Photos taken during prior competitions. Students from the Technion, Ben Gurion University, the Bezalel School of Art and the Shenkar School of Engineering and Design, among others competed at the second Israeli National Concrete Canoe Competition held on Monfort Lake in Ma'allot, Ma'allot is located in the North District of Israel and Monfort is an artificial lake located to the east of Ma'allot. The competition was organized by civil engineering and architectural organizations. Sami Shamoon College of Engineering won the competition. Races were held on Monfort Lake. An article (in PDF) regarding the history of concrete boat construction and the concrete canoe competition can be found here. The 9th Annual Concrete Canoe Competition (Concurso de Canoas de Concreto) was held in Cuririba. The event was sponsored by Universidade Positivo which is located in Southern Brazil. They have one of the largest campuses in South America and concrete canoe competitions have been taking place there since 2003. Students construct (above) and race (below) concrete canoes in Brazil. The second annual Chinese National Concrete Canoe Competition was held in Mianyang City on September 17-19, 2011. The event was organized and hosted by the China Concrete Canoe Competition Committee and co-organized by Mianyang Vocational Technical College as well as Southwest University of Science and Technology. Races took place at Xianhai Lake. Huangshi College of Technology paddles their way to victory in the races! Southwest University of Science and Technology won the overall championship in a field of seven. Two teams from Huangshi College of Technology won the most awards, including the overall second and third prize, the first prize of men’s and women’s 200m races as well as the co-ed 200m race (see photos above). Mianyang Vocational Technical College won best product, and Wuhan University of Technology (see photo below) won best design paper. Wuhan University of Technology was the defending champion. Every few years, the Federal Association of the German Cement industry (BDZ) in Düsseldorf organizes a special type of spectacular... a concrete canoe regatta. This year over 90 teams registered... with participants coming from a number of other countries including Switzerland and the Netherlands. The competition was held in Magdeburg which is the capital and largest city of the Bundesland (State) of Saxony-Anhalt. Magdeburg is situated on the Elbe River and was one of the most important medieval cities of Europe. The University of Twente (Enschede, Netherlands) won the men's and women's races. The design competition was won by the Georg-Simon-Ohm University Nuremberg while the University Lusatian defended their title in the Open Class. "A Revolution in Concrete Canoe Evolution"
In 2012, Team UAH shattered the design envelope when they placed their concrete around flimsy pre-impregnated graphite fiber materials developed for aircraft structures... which they baked and stiffened at elevated temperature after the concrete cured. According to UAH Student Chapter President Matthew Pinkston, "This required a concrete that was workable in the early stages of development which cured quickly to give a high early strength before the shelf life of the pre-preg expired." Charles Boyles, who led the construction team, added, "The mix also had to have adequate flexural strength to sustain the service loads after withstanding the transition temperature of the resin." Team UAH works in the shadows of past entries as their newest one called "EVO" takes shape. It took several months and 50 iterations for the team to design their mix. Pinkston noted: "We employed 4 different cementitious materials, 2 types of free fibers, 2 recyclable aggregates, and 7 different admixtures to make this happen." Although the team faced technical difficulties and it took them 18 days to get from initial placement to final cure, Boyles said: "Our original plan called for producing a finished product in only 7 days and our test results proved that this was possible." Iran's first national concrete canoe competition took place on Kish Island where 20 teams from state and Islamic Azad (Open) universities were scheduled to compete. Seven of the 20 boats arrived in tact and the competition rules were eased after the judges found that only three entries fully met the competition guidelines. In the end, the Islamic Azad University of Marand won the competition. A team from the Islamic Azad University of Zanjan placed second. Qum University was third. This entry was designed for both speed and maneuverability by Ali Ghaderpour. The canoe was built by students from Azad University of Kerman. Kish is a 91.5-square-kilometer (35.3 sq mi) resort island located in the Persian Gulf. It is part of the Hormozgān Province of Iran. Organizers hope to expand the competition to include international entries next year. Meanwhile, hats off to the competition organizers, judges, and participants for a job well done. It goes to show you that, from a structural standpoint, transporting concrete canoes to a competition can be as worrisome as racing them; and, that organizing a competition such as this is not as easy as it seems. The bottom line is that everyone at the competition had fun. We take great pleasure in welcoming Iran as the newest addition to our international contingent. The Civil and Architectural Engineering Society (CAES) at Sultan Qaboos University was planning to establish an Oman Concrete Canoe Competition (OCCC) during the Muscat Festival in 2010, but it had to be cancelled because of H1N1. Our understanding is that the competition will be held during the period April 1-8 during the forth students engineering gathering 2010 at Sultan Qaboos University in Muscat. We're flying the Omanian flag on our banner (see Gateway). If your country is not included on this site but you're concrete canoeing, please let us know and we'll include you. We're learned from a student at the Istanbul Technical University in Istanbul, Turkey... that plans are currently underway to organize a concrete canoe competition there. Our best guess is that the competition will be held at Halic, a horn shaped estuary that bifurcates the European side of Istanbul. June/July 2010 is the most likely timeframe. We're flying the Turkish flag on our banner (see Gateway). If your country is not included on this site but you're concrete canoeing, please let us know and we'll include you. The third annual South Australian Concrete Canoe Competition was hosted by Adelaide University earlier this year. The University of South Australia participated in the event that was sponsored in part by the Concrete Institute of .Australia. 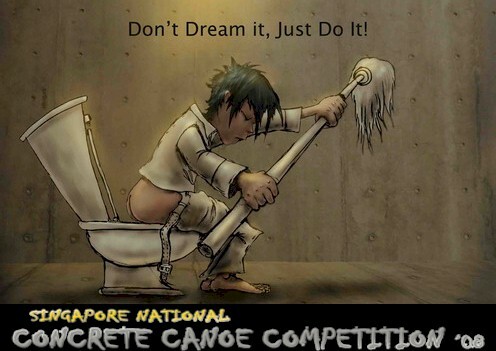 The first Singapore National Concrete Canoe Competition ended with racing on May 25, 2008. The event was sponsored by Nanyang Technological University. Welcome Singapore! The University of Sharjah, American University of Sharjah, Dubai Men’s College and Abu Dhabi Men’s College participated in the first concrete canoe contest held in UAE at the Hiltonia Beach Club in Abu Dhabi. Last year Michael Carnivale, long time CNCCC member, started giving guidance to a team of high school students at Philips Exeter Academy on building a concrete canoe. The students built a mold to the specifications currently used for the National Competition and recently poured the concrete and floated the canoe. Students carry their concrete canoe across campus after performing a successful float test. Philips Exeter Academy is a prep boarding high school in New Hampshire, one of the leading high schools in the nation and around the world. The school offers over 450 courses in a variety of subject areas and is known for its unique method of teaching: the Harkness table. With each class composed of a maximum of 13 students, classes are taught around an oval table where seminar style discussion is encouraged. The canoe was build using a wooden male mold whose dimensions conformed to the 2011 National Concrete Canoe Competition guidelines. The Academy has over 100 different clubs, one of which is MecExeter, the Engineering Club on campus. Started in 2008, MecExeter has completed projects that include a trebuchet, balsa wood bridges, a potato cannon, and most recently their concrete canoe. The club has over 30 active members ranging from 9th to 12th graders. For the second year in a row, students at Romeo Engineering and Technology Center (RETC) located in Romeo, Michigan, have proven what appears to be impossible - design, build and float a canoe made of concrete. Left: Stephen Figurski and Emery Arnold (left to right) take their canoe for a spin. Right: 2010 NCCC men's sprint - Team UAH. RETC photo by Evva Dossin; race photo courtesy of Concrete Canoe Pictures. The concrete canoe project at RETC grew this year to not only include Craig Bryant's Construction Trades and Evva Dossin's Drafting classes, but also Aleda Morr's Math-Science Math Theory and Alice Gryspeerd Biology classes. The concrete canoe is a cross-curricular project incorporating theories of science, math, design and construction all in one. Furthermore, students learned the value of teamwork and communication. Read more here. Something tells me that the national contingent will be interested in recruiting students like this. We have a couple of vacant spots on Team UAH. Concrete Canoe Magazine is looking for articles to be published in the next edition (2011). In 2006, alumni from Laval (eight time Canadian National Concrete Canoe Champs - statistics) published the inaugural issue of "Concrete Canoe Magazine." Their intent was to disseminate knowledge and recent developments in concrete canoeing and to share experiences among concrete canoe enthusiasts and former participants. If you haven't seen the magazine yet, you can download PDF copies of the first three issues... free... by visiting. The first three issues are free on line. The 4th edition was not published in 2009 due to financial constraints... but it recently came out in 2010. We've reserved this partition for links to announcements of any kind and would like to get one or two schools to volunteer to publish (on the web) a concrete canoe newsletter on their site for ConcreteCanoe.org. We envision that the host school(s) would write an editorial section and collect information from other organizations. If you're interested in volunteering, please contact us. Simply provide an email address to which information should be sent. We'll make the announcement here, include the link to your newsletter, and give you plenty of credit. Thanks! Until we get a volunteer to host the newsletter, please fell free to let us know what your organization is up to and we'll provide a link below. Joan Buhrman, ASCE, Anthony Reed, "They Are the Champions. Concrete Canoe Champions, That is. 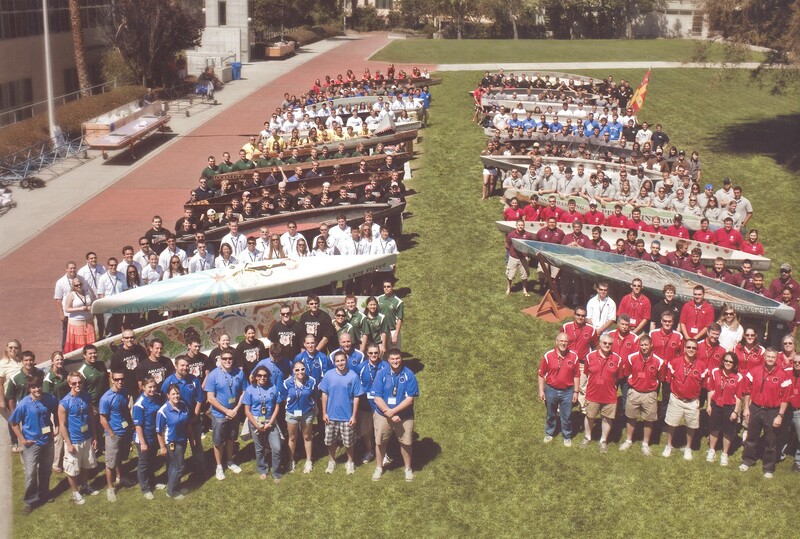 University of California Berkeley Wins National Concrete Canoe Competition" June 13, 2009. Team UAH - "Concrete Canoe Competition Becomes Part of U.S. Congressional Record" - Washington, D.C., June 28, 2001. Team UAH - "Alabama State Senate Passes Resolution Commending UAH on Winning an Unprecedented Fifth Concrete Canoe National Championship" - July 12, 2001.